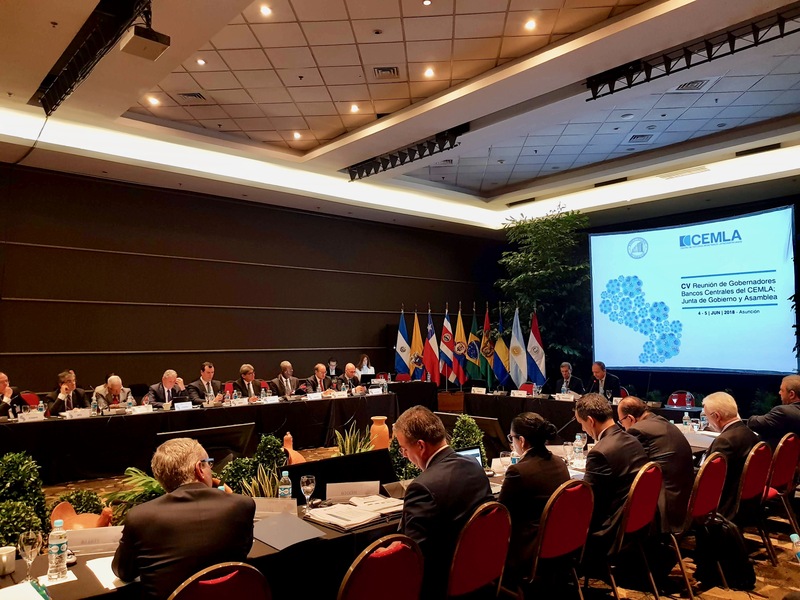 On 4 and 5 June, the CV Meeting of the Central Bank Governors of CEMLA was held in Asunción, Paraguay. The meeting was sponsored by the Banco Central del Paraguay, represented by its President, Mr. Carlos Fernández. Once the meeting was formally opened, the sessions of analysis and debate began. The first session on World Economic and Financial Outlook, featured presentations by Thomas A. Connors, Deputy Director, International Finance Division, Board of Governors of the Federal Reserve System; Luis M. Linde, Governor, Banco de España; and Alejandro Díaz de León Carrillo, Governor, Banco de México. During session II, Francisco Eduardo Gismondi, Vice-Superintendent of Financial and Exchange Institutions, Banco Central de la República Argentina, presented the Topics under discussion in the G20. The next session, on the Financial Sector Development in Latin America and the Caribbean in Recent Years, was presented by Carlos Carvallo, Member of the Board of Directors, Banco Central del Paraguay; John Rolle, Governor, The Central Bank of The Bahamas; and Óscar Monterroso, General Manager, Banco de Guatemala. In Session IV, José Darío Uribe, Chief Executive Officer, Latin American Reserve Fund, and Luiz A. Pereira da Silva, Deputy General Manager, Bank for International Settlements, discussed on Optimal Reserves Management. Following, New Technologies: Opportunities and Challenges for Financial Intermediation, were discussed, session in which the lecturers were Carlos Costa, Governor, Banco de Portugal; Mario Bergara, President, Banco Central del Uruguay; Luiz A. Pereira da Silva; and John Arroyo, Deputy Governor, Services, Banco Central del Ecuador. The last session, before the closing of the meeting, dealt with the Monetary Policy Challenges in Latin America and the Caribbean, and the presentations were given by Mario Marcel, President, Banco Central de Chile; Juan José Echavarría, General Manager, Banco de la República; Julio Velarde, President, Banco Central de Reserva del Perú; and Raúl Mendoza, Monetary Policy Adviser, Banco Central de Bolivia. At the end, President Fernandez offered some closing remarks and thanked the participants for their presence. Between the sessions, the meetings of the Board of Governors and the Assembly of CEMLA were also held.